Mesenchymal stem cells or mesenchymal stromal cells (MSCs), are somatic or adult stem cells that can be isolated from various sources, including bone marrow, adipose tissue or umbilical cord. Isolated MSCs are fibroblast-like cells that demonstrate site-specific differentiation. MSCs may regenerate damaged or diseased tissues in vivo and potentially play a role in immunomodulation, which provides the basis for a variety of clinical applications. In this application protocol, we describe the enumeration, isolation, expansion and quality assessment of bone marrow-derived MSCs. MACS Columns and MACS Separators: CD271+ cells can be enriched using MS or LS Columns. Positive selection can also be performed using the autoMACS Pro or the autoMACS Separator. (Optional) Fluorochrome-conjugated antibodies for flow cytometry analysis, e.g., CD271 (LNGFR)-PE (# 130-091‑885), CD271 (LNGFR)-APC (# 130-091-884), or CD45-FITC (# 130‑080-202). Learn more about our antibodies and dyes. Isolate mononuclear cells by density gradient centrifugation using Ficoll-Paque™. Use the protocol of the following data sheet. The MSC Enumeration Kit is especially designed to quantify human MSCs from fresh bone marrow aspirate (BMA) with a standardized flow cytometry protocol and gating strategy based on the expression of CD271 (LNGFR) and Anti-MSCA-1 (W8B2). The kit allows identification of CD45+ leukocytes and CD271 (LNGFR)+/Anti-MSCA-1 (W8B2)+ MSCs, which are also CD45dim. Follow the protocol of the kit data sheet. Bone marrow-derived human MSCs can be isolated by plastic adherence or by specific surface markers such as CD271. Marker-based MSC isolation provides more uniform cell populations that show higher clonality, compared to plastic adherence. Use the CD271 MicroBead Kit, human to isolate MSCs. Follow the protocol of the kit data sheet. We recommend filtering the magnetically labeled cell suspension to guarantee a single-cell suspension before separating cells on the column. Apply cell suspension and PBE buffer to the filter on the column. 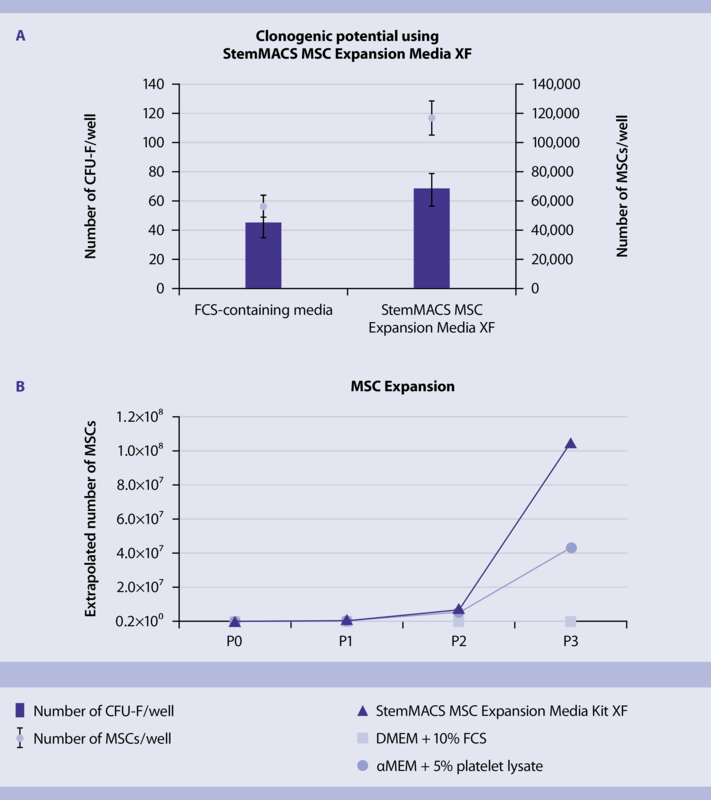 Expand isolated human MSCs using the StemMACS™ MSC Expansion Media Kit XF, an optimized and standardized complete medium for the reproducible and reliable generation and expansion of MSCs from bone marrow and other tissue sources. Follow the protocol of the kit data sheet. Superior expansion of MSCs. MSCs cultured in StemMACS MSC Expansion Media XF showed an increased clonogenic potential (A) as well as cell proliferation rate (B) compared to MSCs cultured in αMEM + 5% platelet lysate or when culture in media containing 10% fetal calf serum (FCS). MSCs cultured in StemMACS MSC Expansion Media XF showed an increased clonogenic potential (A) as well as cell proliferation rate (B) compared to MSCs cultured in αMEM + 5% platelet lysate or when cultured in media containing 10% fetal calf serum (FCS). Expanded MSCs are perfectly suited for immunomodulation. Isolated MSCs were expanded either in StemMACS MSC Expansion Media XF or αMEM + 5% platelet lysate. Immunomodulation was measured using the MSC Suppression Inspector by cell proliferation of responder T (Tresp) cells in co-culture with MSCs. In this proliferation assay, the plasma membrane of Tresp cells is stained with a fluorescent dye. With each division of the Tresp cells, the dye is increasingly diluted. Consequently, a decrease in MFI indicates a high Tresp cell proliferation rate. Upon polyclonal stimulation, Tresp cells alone showed a strong proliferative response. Co-culture of MSCs with Tresp cells resulted in reduced proliferation of Tresp cells. The presence of MSCs cultured in StemMACS MSC Expansion Media XF inhibited Tresp cell proliferation to a level of non-stimulated Tresp cells. Expanded MSCs are perfectly suited for immunomodulation. Isolated MSCs were expanded either in StemMACS MSC Expansion Media XF or αMEM + 5% platelet lysate. Immunomodulation was measured using the MSC Suppression Inspector by cell proliferation of responder T (Tresp) cells in co-culture with MSCs. In this proliferation assay, the plasma membrane of Tresp cells is stained with a fluorescent dye. With each division of the Tresp cells, the dye is increasingly diluted. Consequently, a decrease in MFI indicates a high Tresp cell proliferation rate. Upon polyclonal stimulation, Tresp cells alone showed a strong proliferative response. Co-culture of MSCs with Tresp cells resulted in reduced proliferation of Tresp cells. The presence of MSCs cultured in StemMACS MSC Expansion Media XF inhibited Tresp cell proliferation to a level of non-stimulated Tresp cells. Preservation of differentiation potential. Human MSCs cultured in StemMACS MSC Expansion Media XF were differentiated towards osteogenic (A), adipogenic (B), or chondrogenic (C) lineage using StemMACS MSC Diff Media. Cells cultured in StemMACS MSC Expansion Media XF maintain broad differentiation potential. Human MSCs cultured in StemMACS MSC Expansion Media XF were differentiated towards osteogenic (A), adipogenic (B), or chondrogenic (C) lineage using StemMACS MSC Diff Media. Cells cultured in StemMACS MSC Expansion Media XF maintain broad differentiation potential. Growing interest in using MSCs for clinical research necessitates a fundamental understanding of mechanisms and processes underlying their differentiation into specific cell types, as well MSC phenotype validation of cultivated cells. The MSC Phenotyping Kit, human is based on ISCT (International Society for Cellular Therapy) markers for human MSCs, and helps easily perform standardized phenotyping of culture-expanded MSCs by flow cytometry. Follow the protocol of the kit data sheet. To plan a dedicated antibody panel for your MSC research project, use our antibody panel builder. Differentiation potential is a meaningful tool to qualify and define a MSC population. Grade of differentiation into adipocytes, chondrocytes, and osteoblasts is influenced by MSC origin, so for example, MSCs from bone marrow show greater potential to differentiate into osteoblasts than MSCs from umbilical cord. Increased age of donor and passaging of cultured MSCs also decrease differentiation potential. StemMACS™ AdipoDiff, OsteoDiff, and ChondroDiff Media, human are optimized differentiation media for human MSCs isolated from various tissue sources. Each medium supports differentiation capacity analysis or quality control of expanded MSCs, as well as in vitro studies on MSC differentiation processes, including gene expression and protein profiling. Follow the protocol of the relevant kit data sheet. In the last few years, scientists have directed their attention to the immunomodulatory potential of MSCs. MSCs derived from bone marrow have been observed to suppress proliferation of T cells.1,2 This function of MSCs can be analyzed using the MSC Suppression Inspector, human, which contains T cell stimulation reagents optimized for an MSC suppression assay. Follow the protocol of the kit data sheet. Di Nicola, M. et al. (2002) Blood 99: 3838–3843. Bartholomew, A. et al. (2002) Exp. Hematol. 30: 42–48. Godthardt, K. et al. (2016) Improved clinical-scale MSC isolation from primary tissue and expansion with a GMP matrix- and xeno-free medium. ISCT, Singapore.